You're the the CEO, the boss, the queen bee. And getting what you want out of your worker bees looks increasingly linked to how happy said worker bees are. You ask them how things are going. Send out surveys. But what you really want is stats, a 0-100 system of how happy the worker bees in your hive really are. 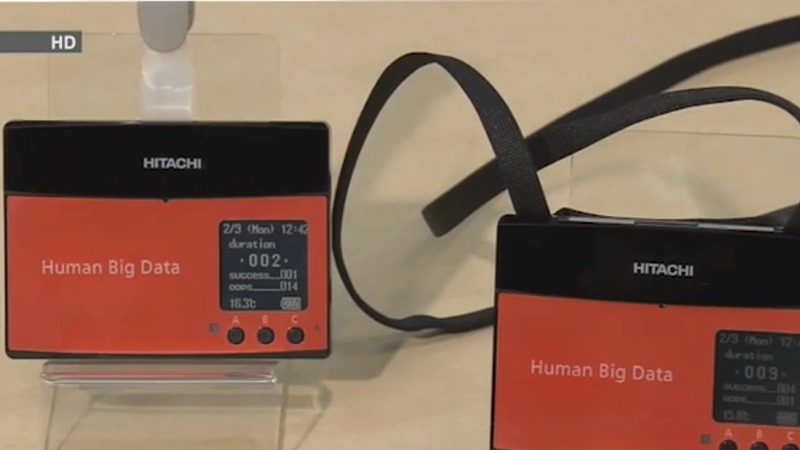 This is what Hitachi is trying to give you with its next-gen, sensor packed, happiness measuring ID badge. In the confusing world of mood monitoring wearable tech, though, there's a lot of questions to be asked. So we thought we'd ask them. An obvious question but one that Hitachi isn't really telling us at the moment. Essentially, Hitachi has come up with a happiness algorithm based on how much you sit, stand, nod, type and walk around at work. The badge houses an accelerometer to measure your activity, including how quickly, say, you are moving and collects data on your movements an incredible 50 times a second throughout the day. The benefit of the system is that ideally all employees in a business would wear a badge with the wearable sending data to cloud based servers in real time. The aim isn't to get individual data but an overall score of workplace happiness. It's a system Hitachi dubs Human Big Data. How do happy people move? This is what Hitachi is keeping a real secret. We're going to guess that if you sit still for four hours then amble to get lunch before another four hours of absolutely focused sitting and nod only twice in the whole day, Hitachi would deem you unhappier than someone running around, frantically nodding and standing around chatting. Of course, we're sure Hitachi has something a little more sophisticated than this - algorithms to account for weak bladders, for instance, or a budding office romance. Hitachi obviously realises workers are more than robots - chief researcher Kazuo Yano is a fan of the classic after work drink in terms of the benefits for communication and overall happiness. At first we thought Hitachi had chosen to stick the acceleration sensors into a clip-on badge to cut down costs but the service is actually going to be sold as a Y100,000 a year service. Per card. That's around £500 per year per employee. Much more likely is that it's something many workers wear already - to clock in and out of offices and factories. Then there's the bad image that shackle-style wrist wearables can get, especially if your boss is telling you to wear one so he or she can find out what mood you're in. Companies like Amazon with its super scary Motorola-built productivity tracker, the WT4000, have given wrist-based work wearables an iffy name that will be hard to shake. This is a pretty pressing question. For Hitachi's system to work, it needs to compare the 0-100 happiness score of a large group of workers. If half a business' employees opt out, chances are the Big Data will be less reliable for the happiness of the group as a whole. For anyone concerned about how their bosses will use the information, Hitachi says that the primary purpose is to determine how groups of people feel, not individuals. But whether or not individuals can opt out will no doubt be down to the businesses who choose to try out Hitachi's tech badges from April this year. It plans to roll out the wearable for its own employees too. How can we track our own mood? If you want to take your happiness into your own hands, mood measuring - and enhancing - wearables are starting to crop up. And it's not all bogus science. Tech companies like Embrace and Thync are using everything from galvanic skin response to transcranial stimulation to track and alter your mood. Soon you'll be able to keep an eye on stress levels with a wristband or increase your alertness using a headset. All while having a moan about how your new boss is making you wear a dorky badge at work to invade your mood privacy.